Over the weekend Team Meat teased that their “game about cats”, Mew-Genics, will feature full on (literal) cat fights as part of its core design. 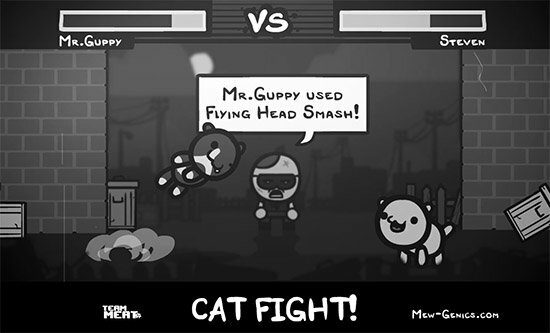 The game’s co-creator, Edmund McMillen, didn’t expand upon how the fighting-felines will fit into the overall structure, but the teaser artwork did reveal that Butch will be in charge of the “shady” event — confirming at least one part of our speculation as to what this crazy title is actually about. The tease didn’t specify how the cat fights play out, so it is unclear at this point if players will have direct control over their cats during the battles, if the game will have some kind of turn based attack system, or if it all happens automatically based on a stats. The one thing we do know is that appears to be life bars for the felines, so it is probably best to stock up on “Petrified Poop” before tossing your cat into the ring. Interestingly, McMillen also noted in the update that all of the screenshots that have been posted of Mew-Genics over the last 17 weeks are actually “faked graphics”. He didn’t provide any explication as to why Team Meat decided against using actual screenshots for all of the “Caturday” teasers, but the end result of this revelation is the same — not only do we still have very few details as to what kind of game Mew-Genics is, but we also don’t even really know if it will look anything like all the black-and-white artwork that we have seen so far. According to McMillen we will all find out “what this damn game is” in a full reveal next week. Hopefully, that also means we will also finally see what Mew-Genics really looks like, when it will be released, and on what platforms (apart from Apple iOS and Steam). We will keep an eye out for Mew-Genics‘ full reveal and let you know all the details after they are announced.